It turns out turning more to wind energy is not just kind to the planet, it’s kind to your pocket as well. But what does this all mean? Here at bonkers.ie we find out. Climate change has changed the landscape a lot over the past few years, and this week it's hard to ignore with a polar vortex covering much of the US, while Australia is setting temperature records at the other end of the scale. One of the cornerstones of the plan to tackle climate change is diversification of energy sources, and nothing symbolises that more than wind farms. However it seems that the modern day windmills are not just good for the environment, but they also provide energy phenomenally cheaply. A report released this week from the Irish Wind Energy Association (IWEA) has some stunning figures. Using leading energy consultants Baringa, the report reveals the results of a cost-benefit analysis from the years 2000-2020. Between these years the report shows that the net cost of wind energy per person in Ireland is less than €1 per year for consumers. Over this period the savings on fossil fuels has been €2.7 billion, while it has reduced CO2 by 33 million tonnes. From a starting point of near zero in 2000, wind farm capacity in Ireland grew to reach over 3.4GW in 2018 and is expected to exceed 4.1GW by 2020. Initial figures indicate that in 2018 wind power surpassed 30% of Ireland’s entire electricity supply for the first time. The IWEA report considered not just the financial supports for wind energy but also the cost of additional investment in the electricity network and the additional technical costs of accommodating wind energy on the electricity grid. Against this were offset the financial benefits of wind energy such as fines avoided, reduced capacity payments to fossil fuel companies and – most importantly – the impact of wind energy on wholesale electricity prices. Every day electricity generators, fossil fuels and renewables compete against each other in an auction to provide power to the suppliers who sell it on to homes and businesses. The more wind energy on the system, the more it pushes out fossil fuel generators that are much more costly to run." 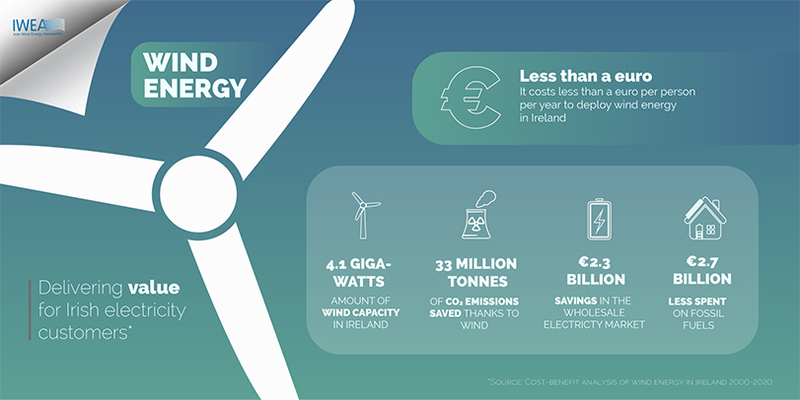 The report shows that wind generation in Ireland between 2000 and 2020 will result in a total net cost to consumers, over 20 years, of just €63 million, which equates to a cost of less than €1 per person per year. The analysis doesn't take account of the broader socio-economic benefits of wind such as job creation and cleaner air, meaning the savings could be even higher. Dr David Connolly, CEO of the Irish Wind Energy Association, which commissioned the report said: “For the price of a pint of milk wind energy has become a leader in Ireland’s fight against climate change while making us more energy independent and creating thousands of jobs. As an industry we’re focused on reducing the price of wind energy even more in coming years. There is enormous potential in developing Ireland’s incredible offshore wind energy resources and still huge opportunities for expanding the amount of renewable energy we can generate onshore. What do you think? Will 70% of Ireland's energy come from renewables by 2030?